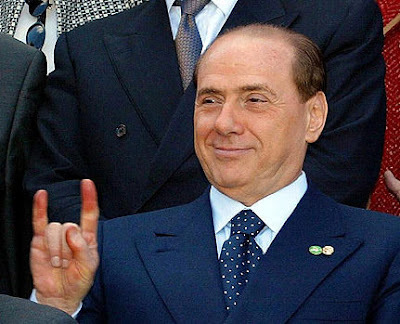 Following the political turmoil caused by Mario Monti’s announced resignation, and in order to achieve a compromise solution to Italy’s political deadlock, Silvio Berlusconi has been nominated as the new Italian Judge before the European Court of Justice. “Berlusconi is the ideal candidate for the job: there is no other Italian citizen with more experience in Court proceedings, and his contribution to European criminal law is beyond question“. Chillin’Competition has learnt that Mr. Berlusconi has already initiated the recruiting process for his new clerks. We have had exclusive access to a picture taken outside the villa where the interviews are being held; the picture conveys the sense of excitement and urgency prevalent among candidates to the job (see here). The content of the tests remains confidential, but our sources tell us that there will be no written part. We are giving out a special pack of Christmas delicacies from my family’s bakery to the person who sends us the funniest fake news. We donñt care about length: they can be one page, one line, even just a headline could do the trick. We’ll hold a public vote next Friday. You can get some inspiration from some of our previous fake news, such as: Reactions to the endives cartel; The post of a fresh summer day; or An Antitrust Challenge to God. Big law associate copied in an email. Alfonso Lamadrid and Nicolas Petit do not exist. All along this blog was written by a man behind a curtain known as The Wizard of COMP. In a press release published on 20 December 2012, the European Commission confessed that its interpretation of parent-subsidiary liability had been “just a misunderstanding”. In view of the imminent fulfilment of the Mayan prophecy and the upcoming Armageddon, Commission Almunia has put an end to what it seems now, “was only a joke”. Following a complaint by the company SaurikIT, the provider of the alternative app shop Cydia for jailbroken iPhones, the European Commission investigates whether Apple has abused its quasi-monopoly power over the iOS ecosystem to foreclose competing “Apps Stores” from its ecosystem by making jailbreaking too difficult. Jailbreaking is necessary to remove restraints from the heavily restricted iPhone operating system iOS. Recent findings suggest that 100 percent of the iPhones shipped in the European Union come preloaded with Apple’s iOS operating system and that 96 percent of the iPhone buyers in the European Union are completely indifferent to price increases. Furthermore, empirical evidence shows that a vast majority of iPhone buyers wouldn’t even notice a price increase of 10 to 25 percent. Apple’s App Store commands 99.15 percent of the market in iOS apps while Cydia’s market share fell from 2.24 percent in 2010 to 0.85 percent subsequent to the introduction of iOS 6 this year. A Cydia executive pointed out that Apple “uncompetitively made jailbreaking more and more complex in order to drive Cydia out of the market”. The Commission announced on Tuesday that there are strong concerns about Apple’s conduct. Apple should be obliged to disclose and share iOS security vulnerabilities with its competitors to allow easy and hazzle-free jailbreaking for consumers. In the long run, the Commission considers to commit Apple to sell factory jailbroken iPhones in the European Union. Apple officials couldn’t be reached for comment. Microsoft Office Professional 2013 will feature a new application, Compliance 2013, which will enable users to self-monitor their undertakings.